Successfully Added Radio Control Mini Toy RC Helicopter to your Shopping Cart. Radio Control Mini Toy RC Helicopter for mission critical fun and excitement! What do you get for a child whose mind has grown dull from too many videogames? This fantastic RC toy is a delightful challenge to young minds in their attempt to maintain flight just like real helicopter pilots and is sure to bring smiles and laughs to any child the minute they pick up the remote control. This RC mini helicopter comes with a stabilizer bar and twin rotors for better flight performance and fun. Stiff rubber blades and a pliable plastic body ensures that it can take a fall and come back strong. What's more, an independent tail blade comes in handy for straighter travel. The remote control features one thumbstick for throttle in the vertical plane. Ascend and descend with power. A second thumbstick allows you to strafe left and right just like a real helicopter pilot. Finally a trim dial provides counterspin like an actual helicopter to keep it from spinning along with the power blades. 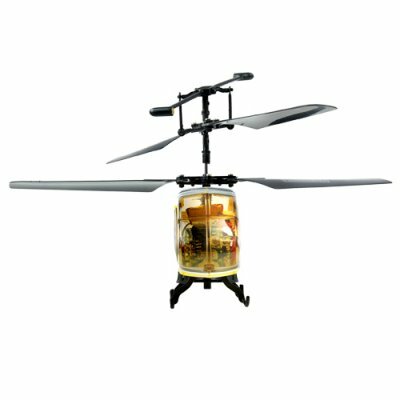 Better yet, this mini toy RC helicopter comes with 3 channels functionality meaning that you and two friends can operate your helicopters at the same time. Get one to play with in your own office and then buy a few more to re-sell on eBay, Amazon, uBid, or your own physical/internet store. Chinavasion's factory-direct prices is your connection to great electronic products. Fully charge the battery for 4 hours before first use. I really enjoyed getting the hang of this helicopter. I wasn't expecting much for the price, but full control of the helicopter is obtainable in low to no wind. very good indoor product.